Are insects and pests inhibiting the fun in your own yard? The Pest Force has a solution. Our yard treatments can eliminate a variety of outdoor pests including fleas, ticks, ants, mosquito, mole crickets, chiggers, chinchbugs, mites, grubs, thripes, earwigs, spiders, pill bugs, army worms and more. Our expert Pest Management Professionals (PMPs) know the insects and how treatment is affected by the seasons, time of day and even the weather and they adjust the necessary treatments accordingly. Our Customer Service Specialist will schedule a specific appointment time at your convenience. It is your choice whether or not you are home for the treatment—payment may be made by Visa or MasterCard over the phone in advance if you choose to be absent. In preparation for the treatment the lawn should be mowed and watered. All clutter should be picked up and personal items like chairs and balls should be removed. Your PMP will arrive promptly, discuss the issues you are having, go over the paperwork and receive payment. We accept cash, check, Visa and MasterCard. He will inspect and treat the yard from the foundation outward for up to ½ acre. Each ½ acre thereafter is an additional reduced price. He will discuss his findings with you and leave his recommendations. It is important that people and pets stay off of the treated areas for 2 hours or until dry. The Pest Force is also able to focus on specific outdoor pest problems such as mole crickets or centipedes around a foundation or springtails in a mulch bed. Mosquito numbers can become unbearable in our area and we can bring them down to an acceptable level. 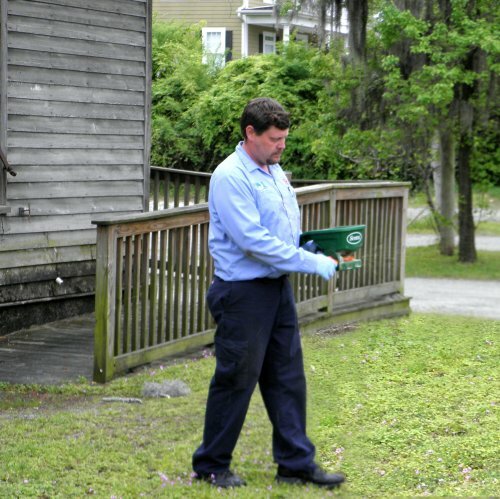 The Pest Force has the solution for each of these and many other yard pest problems. Let us customize a program for you. Yard treatments are offered as one time services with a 30 day call back guarantee or as a Quarterly Program with complimentary year round call backs. Yard treatments and other additional treatments are offered at significant discounts to our Quarterly Pest Management customers. 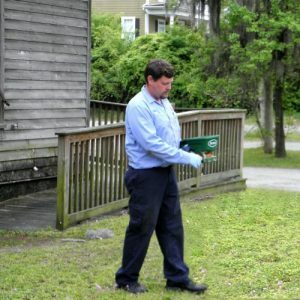 The Pest Force services the following areas for Yard Treatment and Quarterly Pest Management: Myrtle Beach, North Myrtle Beach, Little River, Longs, Conway, Carolina Forest, Socastee, Surfside Beach, Garden City Beach, Murrells Inlet, Litchfield Beach, and Pawleys Island.